Ditton Park.Home of Radio Research.1924-1979.History. The articles are listed below in chronological order. Click on a title to read the article or simply scroll down the page. 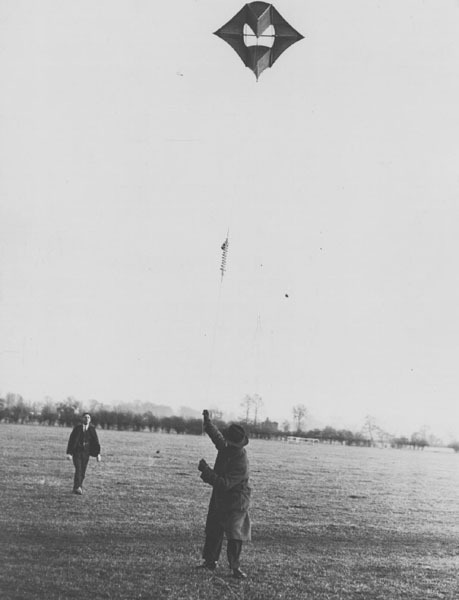 The photograph opposite is of Chapman and R.H.Barfield at Ditton Park with a kite with transmitter for Direction Finding tests. 1929. Click on the photo to enlarge. In the early days at Ditton Park the programme of work comprised of two sections - one engaged on radio direction-finding and the other on field-strength measurements. Dr. R. H. Barfield, who had been appointed shortly after the Radio Research Board was founded in 1920, was in charge of the first section with two assistants, Captain S. R. Chapman and Mr. A. H. Free, while I worked with Professor J. Holligworth in the second section. The field-strength measurements were also made simultaneously in Manchester, Glasgow and Aberdeen and sent to Slough for co-ordination and study. The Radio Research Board controlled the work on similar lines to the present but the greatest difference lay in the personal relationships between members of the Board and members of the staff. These were only possible because there were so few of the latter. Two examples illustrate this point. The Chairman for the first ten years was Admiral of the Fleet Sir Henry Jackson and he gave his personal attention to each paper that was published by members of the staff. His personal interest was extended to others engaged on R.R.B. work and it has been estimated that he dealt with over 100 papers during his term of office. The second example occurred when plans for the second International Polar Year were being discussed. Sir George Simpson, who had been with the Scott on his famous Antarctic expedition said, 'A Scott who has matured in Canada for five years is the right man for this expedition.' I don't know his source of information but it illustrates his personal knowledge which caused me to spend an interesting and happy year at Tromso. The accommodation available at R.R.S. was limited to one hut for the field-strength measurements and three huts for the D.F. measurements. There was, in addition, a small tower used for wave tilt measurements and a large workshop hut for common use. The Admiralty Compass Observatory assisted with transport and other ancillary services and we lunched in the Officers mess which, being up to the standard of a Naval Establishment, was much appreciated. During the early days a few N.P.L. staff also working on the R.R.B. programme visited the station. However, cars were less plentiful in those days and the time-consuming journey by train kept these visits to a minimum. An event, which later had a considerable impact on the station was the arrival in the North Park of a caravan containing the Aldershot Wireless Station of the Meteorological Office. This had been taken over form the Air Ministry and equipped for research on atmospherics under R.R.B. There was also some living accommodation which was set up on the south-east corner of the Park and is now in process of demolition to make way for the M4 motorway. At this period we had little in common with the North Parkers, beyond our allegiance to the R.R.B. They were still comparative strangers when I phoned in December 1927 to tell them their building was on fire. After phoning the A.C.O. and Datchet Fire Brigade I went over to the scene, overtaking the A.C.O. party who were trying to raise steam for their water pump and transport it at the same time. This proved too difficult an operation and had to be abandoned when the complete fire basket fell out. We then laid out the hose for connection to the Datchet brigade who arrived shortly afterwards, only to find the hose differed in size and this too was abandoned. Fire extinguishers prevented the flames from spreading. The most spectacular part of the blaze was the 90 ft. climbabletower as it settled more and more deeply into the pyre, prevented from falling by its stays. The next year a new building containing a laboratory, workshop and office accommodation and a garage for a newly acquired Morris Van was built. The following year (1929) Sir Edward Appleton moved his frequency-change measuring equipment from Dogsthorpe to Slough and I was transferred to look after this new section of the work at R.R.S. At that time transmissions were made from the 'Wireless Hut' at N.P.L adjoining the Director's house and the associated frequency calibration was arranged by another group. At N.P.L. Sir Edward Appleton was a frequent visitor to the station and took part in long series of observations at times. One Sunday evening in chasing critical frequencies we accidentally strayed on to the B.B.C. programme to which the Director of N.P.L. was listening! This hastened our search for a local site for the transmitter. In this process an ex-prisoner of war camp on Ascot Heath was visited and in trying to find the owner, a (fortunately) unsuccessful attempt was made to open a door behind which was a cage of lions belonging to Billy Smart's Circus. Accommodation was eventually obtained in the Clock Tower of the Prince Albert Workshops in Windsor Great Park, ' providing we hid the aerials in the adjoining trees.' A more flexible measuring arrangement was devised which permitted a sequence of operations to be performed at the unattended transmitter. By measuring the frequency change at the receiver, the height of reflection could be measured at noon on a limited number of frequencies. This flexibility enabled a regular series of measurements to be started. It was emphasised that these were for experimental purposes since it was not considered proper for a Radio Research Station to operate an observatory. However, as time went on it was difficult to distinguish between the two and the measurements from the Windsor transmitter gradually 'grew' until the Ionospheric Observatory was an accepted part of the programme. The year 1930 was therefore an historic one in marking the beginning of the first of this new type of Observatory which has increased in importance over the years. A major difficulty at this time concerned the recording of the pulses. The cathode ray tube with its attendant power supplied, timebases and photographic attachments had not been sufficiently developed. The tubes were ' soft' and had only a few hundred hours of life. The H.T. supply of 800-1000 volts was obtained from stacks of dry batteries. A mechanical oscilloscope was used until work on the equipment for the second International Polar Year was started and a suitable C.R. oscilloscope and auxiliary equipment had been developed. The transmitter was built around the Naval Type NT 47 valves and, after its return from Tromso, was taken over to Bawdsey when the Radar programme started. It was during my stay at Tromso (1933) that I learned of the union of R.R.S. and part of the Radio Division N.P.L. under the Superintendent of the former. Referring again to the staff mentioned in the beginning of this note, Captain Chapman left in 1934 to work with the late Mr.H.L. Kirke on the staff of the B.B.C. Mr. Free died in 1946. Dr.R.H. Barfield resigned in 1946 and it was recorded that he was acknowledged as a leading expert in D.F. work and was largely responsible for the lead in this field which this country held at the outbreak of World War II. Prof.J. Hollingworth resigned in 1932 on his appointment as Professor of Electrical Engineering at Manchester School of Technology. On retirement he became Emeritus Professor and is now a working Director with Fielden Laboratories. In presenting these notes the intention is to provide members of the R.R.S. staff with a brief outline of past work on this site. A complete history of the role of N.P.L., Ditton Park, and its outstations would require much more time and research than it has been possible to give to this undertaking. Should it suffice, however, only to draw forth more information from readers, it will have served a useful purpose in providing raw material for any future detailed study. These terms of reference were a result of the need, discovered in the first World War, to organise the scientific work for the services, to prevent overlapping, and to secure an economy of work personnel and equipment. The Radio Research Board, charged with this task, met in February 1920 and set about co-ordinating work then in progress at several Government departments. This it did by forming four sub-committees dealing with (A) Propagation, (B) Atmospherics, (C) Direction Finding, (D) Thermionic Valves. Among those composing this first Board were Rutherford, Townsend, the Director N.P.L., and Admiral Sir Henry Jackson (chairman) whilst the sub-committees listed, among others, C.T.R. Wilson, G.I.Taylor, E.V.Appleton, R.L.Smith-Rose and R.A.Watson-Watt. Although somewhat handicapped by the manpower shortage that followed 1918, action was taken in respect of the 'Aldershot Wireless Station' of Air Ministry Meteorological Office, which was taken over by D.S.I.R. and equipped for the study of atmospherics. The N.P.L. at Teddington agreed to undertake a share in the research in addition to work of an allied nature which had already been carried out there for some years whilst the Direction Finding sub-committee initiated a programme of research into the cause of errors in the location of transmitters, and into allied problems. A site 'comparatively free from local errors' was obtained, by permission of the Admiralty, at the Compass Observatory Ditton Park.' This was in West Park, in which the present R.R.S. buildings stand, the occupation of North Park by the Atmospherics research station was still a few years off. One cannot but speculate on how much at least one other factor influences this choice of site. Admiral Jackson, chairman of the Board, was, in the '90's an early and successful experimenter in several forms of wireless signalling; though he was outstripped by Marconi, and perhaps handicapped by the needs of security in establishing scientific priority, his interest in the subject never flagged. It is said that during his chairmanship he personally read every offical paper written by the Board's research workers. His prestige as a high ranking officer who understood the needs of research was surely more than sufficient to persuade the Admiralty to grant the concession. By 1921 the Board was able to report that satisfactory progress had been made at its three main centres, N.P.L., Ditton Park and Aldershot. Experiments involving liaison with other Government departments were begun, and a 'translator with scientific qualifications' appointed to produce abstracts for monthly circulation. Work on field strength measurements was added to the Ditton Park programme, and in connection with this an extensive study made of the methods of screening units and groups of apparatus from electro-magnetic fields. A contributary reason for this work is stated in one report to be the gradually increasing number of continuous wave generators in use, replacing the early spark transmitters. The results of it appeared in the form of a paper by Dr. Smith-Rose on the 'Screening of a Triode Oscillator' together with some notes on receiver design by J. Hollingworth. For some screening experiments a convenient laboratory was formed by a large iron pipe and it is recalled that on at least one occasion a visitor was mystified by the emergence and disappearance of the scientists involved in this work, one instant someone was visible in the Park, the next, no sign of humanity; though the field was, like Prospero's Isle, full of noises emanating from this curious workshop. The work on direction finding and associated problems continued throughout 1922. Results entitled Discussion of the Practical Systems of Radio Direction Finding by Reception, were published in the first of a series of Special Reports. This together with work by Smith-Rose and Barfield on various local effects in reception helped to clarify many problems. Further studies were made of screening, and 'Experiments which are likely to lead to valuable results have also been made with a coil rotatable about a horizontal axis.' This was work on the angle of arrival of R.F. energy, a type of investigation shortly to yield results of fundamental importance. Another directional experiment at this time was the simultaneous location by receivers at Ditton Park and Orfordness of a sender installed on 'a vessel of the Great Eastern Railway Company.' The Radio Research Board had by now five sub-committees, a further one (E) having been formed to consider problems in wireless telephony. The wisdom of their decisions was reflected in the adoption of their program as suitable for international research at the International Conference on Sceintific Wireless Telegraphy. Directional work and screening having resulted in a large amount of reliable data, the report of the Board for 1923-24 went on to say 'Progress would therefore seem now to be in the direction of a better understanding of problems of the propagation of radio waves through space' - a statement of policy that was to affect work at Slough for decades to come. About this time, the War Department gave notice that they wished to re-occupy the Atmospheric research site at Aldershot. The Admiralty, presumably approached by Jackson, offered facilities for transfer of the station to North Park of the A.C.O. grounds. This move, it was said, would not interfere greatly with the progress of the work in hand. Past work was summarised in a lecture to the Radio Society of Great Britain by the officer in charge of the station, R.A. Watson Watt. By July 1924 the move was completed, automatic recorders were installed and a start made on studies of atmospheric potential in co-operation with Professor Appleton, Watson-Watt continuing to supervise these branches of research at the new site. Some traces of these days still exist. The now dilapidated building at Ditton Corner which narrowly escaped the scythe of the motor-way, and the old canteen, still used as a store, were formerly part of the caravan which set out from Aldershot to North Park. The same workers also noted that the Adcock system of direction finding, neglected since 1919, was worthy of fuller investigation, and finding it to be very effective, made this known in 1926. the description of their apparatus is interesting; the aerials were supported on poles 44 feet high at the corners of a 20 foot square, and the system required that the receiver, and operator should be at the centre. The receiving hut was therefore suspended 20 ft above ground by insulated steel ropes from cross beams attached to the poles. The field strength work proceeded at Slough, among other sites, and an investigation by Hollingworth and Naismith led to a survey of the field produced in various parts of the country by certain fixed transmitters. Results from this agreed with observations of Smith-Rose and Barfield all noting anomalies which could be explained by reflection from a region in the upper atmosphere. Concurrent work in North Park was the study of energy distribution, from atmospherics, in certain parts of the radio frequency spectrum. Samples made of 25 c/s 'slices' centred on four selected frequencies; 14, 33, 63 and 79 kc/s were examined. It was initially noted that diurnal variation of atmospheric noise was greatest in the 14 Kc/s band, and that the fine structure of the disturbances varied widely from band to band. The year 1926 also saw the continued development of the Cathode Ray direction finder. Originally conceived during the first World War, and produced at Aldershot, the Ditton Park model operated with two loops 2m. square, and on frequencies of 10 and 80 Kc/s. A further commitment of this group was the study of changes in atmospheric electric field; this was achieved by an apparatus consisting of an exposed spherical conductor together with an electrometer. This method, due to Wilson, was modified by Appleton, Herd and Watson-Watt to include an amplifier and cathode ray oscillograph. It may interest readers to know that it is very probably one of these spheres which has survived that rotates, twinkling and somewhat modified, above the heads of dancers at R.R.S. parties; does it measure romantic potential now? An important period in Geophysics was marked by the years 1925-1927; remarkable progress was made in identifying and investigating the Ionosphere. In 1925, when a reputable engineer could still speak of the 'academic myth' of Heaviside, Appleton and his co-workers at Oxford, using their frequency sweep technique, reached important conclusions soon to be upheld by the results from Ditton Park, mentioned earlier. Of the considerable changes that came about at Ditton Park in the last month of 1927, one resulted from the need for unification and others were brought about by force of circumstances. On the 1st December the trinity of D/F, Field Strength and Atmospherics research combined to form the unity of the Radio Research Station, with Watson-Watt as superintendent. The nature of this work continued much as before, the researching being extended further throughout the radio spectrum. The Cathode Ray Oscillograph was used increasingly as a means of display and circuits and techniques concerning it were being evolved. An attempt to provide simultaneous observations of atmospherics at a number of observing stations was the introduction of the Fultograph. This was a simple and quite effective machine for slow scan facsimile transmission and about this time the B.B.C. had instituted a Weather Map Service which could be received by this device. In addition they agreed to transmit a picture of a piece of graph paper; on being received at the various observing stations this would display marks caused by atmospherics. Thus all stations receiving a given disturbance would have marks having identical coordinates. The records were analysed at Slough. The investigations into the spectral distribution of atmospheric disturbance were renewed with fresh apparatus, though subsequent events prevented an early fulfillment of this aim, and it is interesting to note that the present observations of the diurnal variation of noise at various frequencies do not accord with the early findings. During 1929 Admiral Jackson resigned from the Board because age and increasing ill-health prevented him from continuing his valuable work. The nine years of his Chairmanship had been invaluable in guiding the work of the station and bringing it to a position of strength. He could look with satisfaction on a vigorous establishment at Ditton Park with such an output of work that is was decided that future reports should no longer be included with those of D.S.I.R. but should appear separately. The first of these was in press at the time of publication of the last of the older type of report and when it appeared it gave summaries and detailed accounts of the Station's work together with illustrations, one being of the 'New Buildings' and of the station transport, a Morris van which survived until comparatively recent times. R.R.B. report No.2 published in 1931 had the sad task of announcing the death of Sir Henry Jackson. He survived his resignation for only a short time and died at Hayling on 14th December 1929. During the 1924 war when he held the appointment of First Sea Lord his conduct of the anti U-boat campaign had been the subject of such controversy and criticism, and he was replaced by Jellicoe at the time of the fall of the Asquith government. As a scientist and an early example of a modern scientific leader in what Snow has called the 'corridors of power' he appears to have been an unqualified success. After a short interval the Lord President of the Council appointed Lt. Col. A.G. Lee to be chairman of the Board and under his leadership a survey of the last ten years work caused them to emphasise the need for certain aspects of the fundamental research to be undertaken not only by the universities, but by such bodies as R.R.S. who were in a stronger position to obtain co-operation from observers throughout a large area. In the course of observing this region it had been noticed that reflections were obtainable at nearly vertical incidence and it was arranged for the transmitter and receiver to be a short distance apart, one being at Ditton Park and the other at the 'Prince Consort's Workshop' in Windsor Great Park. (Doubtless Albert the Good would have approved of such scientific work) A series of experimental measurements of apparent heights and critical frequencies was undertaken, which gradually developed into an observational routine. Meantime in the United States a method of pulse retardation sounding had been developed by Breit, Tuve and Dehl and experiments were made at Slough to compare it with the frequency shift method of Appleton and his co-workers. The first transmitter was based on a squegging valve oscillator, a simple self-quenching device derived from a time base circuit produced at Slough for use with the Cathode Ray Oscillograph. This device was the ancestor of the present vertical incidence ionosonde. It was eventually operated entirely at Slough, and when, a short time afterwards, an improved pulse transmitter developed by Ratcliffe and White was installed, the Ionospheric Observatory may be said to have been well established. By the end of 1933 a preliminary analysis of this data yielded much of interest. General conclusions were that solar Ultra-violet light accounted for the normal ionisation of the two main regions of the ionosphere and for the daily and seasonal variations therein. Abnormalities at lower levels might be due to charged particles entering the atmosphere from without and being acted upon by the Earth's magnetic field . There was quite a high correlation (0.75) between thunderstorm activity and an increase in ionisation in the lower layer. The same year also saw another administrative change, when R.R.S. and Wireless Division, N.P.L. were amalgamated to become Radio Department, N.P.L. Watson-Watt was appointed Superintendent. The new organisation had workers with considerable experience in the use of pulse techniques, D/F work and propagation phenomena, also time base circuitry and cathode ray oscillograph display methods. These two matters were of such general interest that a book 'The Application of the Cathode Ray Oscillograph in Radio Research,' written by Watson-Watt and his associates, was published by H.M.S.O. The time was soon to come when this various knowledge was to be integrated to start a major and far-reaching branch of applied science. The report of the Radio Research Board for 1933 was the last to be issued for a period of fifteen years, a hiatus due to anything but inactivity on the part of its members, or the staff at Ditton Park. Work throughout 1934 continued much on previous lines; but in January 1935 Watson-Watt was approached by H.E. Wimperis of the Air Ministry with a question concerning the possibility of radiating energy at a sufficient flux density to cause damage to an aircraft or its occupants. This was to be an attempt to realise the 'Death-Ray' beloved of fiction, and Watson-Watt suggested to A.F. Wilkins that he should examine the question, the initial question being: what energy needs to be radiated from a dipole to raise the body temperature of a man 600 yds. distant by 2oC in 10 minutes? The answer proved to be about 5000 Megawatts! and even if practicable transmitter powers were considered, the size of an aerial system, to give the same effective radiated power, was prohibitive. This communication, though only some 2000 words, has been called one of the most prophetic scientific documents ever produced. It stated the case for detection by reflected radio energy; showed the importance of pulse techniques in determining distance and proposed the use of rotating beams to provide a system showing range and direction on a cathode ray oscillograph diplay at a single station. The cruder but more immediately available method needed three stations to give an accurate 'fix.' The eventual desirability of shorter wavelengths and a possible means of distinguishing between friend and foe were also considered. It says much for the author's appreciation of the situation, on the military sense, that he emphasised the need for proceeding at once with the cruder systems rather than delaying in order to achieve more elegant but less well developed solutions. The memorandum seemed almost 'too good to be true' to the defence experts, and an ad hoc experiment was arranged to take place on 26th February 1935, when apparatus from Ditton Park, installed in the Station's Morris Van, was to be operated in front of Watson-Watt and A.P. Rowe from the Air Ministry. This demonstration was conducted by A. F. Wilkins with the help of A. J. Dyer who acted as driver, scientific assistant and general factotum. Late on the 25th the equipment was placed in position near GSA, the B.B.C. 50m. transmitter at Daventry, which provided the energy to illuminate an aircraft due to fly on a pre-arranged course the following day. The original apparatus, rescued from obscurity in a store hut at Ditton Park and refurbished by our workshop staff a few years ago, is now in the Science Museum. It was, essentially, a spaced aerial phase comparator receiving system and was arranged so that the Daventry ground wave was minimised by a phase shifter in one aerial circuit. The reflected energy was not phased out, and a signal appeared in the receiver which was then displayed on a cathode ray oscillograph. A more detailed account of the doings at Daventry on 25th and 26th February 1935 are given in Mr. Wilkins' own words in an article in 'Electronic Engineering*.' An immediate result was that the cloak of security which had hidden the work of Admiral Jackson forty years before, now descended upon the organisation he has helped to create. No further R.R.B. reports were published, certain staff were moved away, first to Orfordness and then to Bawdsey where they formed the nucleus from which sprang the vast complex of radar. Details of these events do not concern our site at Ditton Park. The actions of such men as Tizard, Blackett, Rowe and Lindemann, who were involved in fostering the work, have quite recently formed the background to a discussion on cultural unity, or the lack of it, and the role of the scientist in modern Government and Administration. Such matters are part of History on a very different scale from these brief notes. * Electronic Engineering, volume 30, 1958, p.140-142. 'The Birth of Radar' by G.R.M. Garratt. This reference was mistakenly given as 'Electric Engineering' in the original article. It was suspected that it was incorrect but the correct reference has only recently come to light. With thanks to Dr Grahame Fraser at The University of Canterbury, New Zealand for the accurate reference. A copy of this article is obtainable from the British Library http://www.bl.uk/. Note added 25th November 2009. The need for development of radio location techniques meant that many of the staff who had hitherto worked at Ditton Park were no longer able to do so for many years after 1935. At this period in the station's history the officer in charge was James Herd, who had been associated with Watson-Watt ever since the early days of the atmospherics investigation at Aldershot. Dr.R.H. Barfield was next to hold the position of officer in charge. The station was fortunate in having such an experienced leader at a time when the accurate location of radio sources was being required over an increasingly wide frequency spectrum. In the '20s joint work by Smith-Rose and Barfield had resulted in much new knowledge of the direction of arrival of radio waves. This partnership continued, for in 1936 Dr.Smith-Rose was appointed superintendent of the Radio Division, N.P.L. the central research organisation to which R.R.S. was responsible. From this time onward the work at Datchet was largely concerned with the improvement of direction finding systems and ionospheric investigations. The Adcock or spaced aerial D/F method was improved until it was capable of operation with 'a high state of accuracy and efficiency over a frequency band from 100 kc/s to 30 Mc/s. An alternative method, using spaced loops, showed great promise in terms of accuracy and frequency range, and by 1938 a paper by Barfiled and Ross showed the application of such a system to the measurement of the lateral deviation of radio waves. The properties of a single loop aerial and its application to this field of work were not neglected. In a contribution on the subject, H.G. Hopkins described a loop apparatus capable of operating at 50 Mc/s, and R.E. Burgess published a 'Theoretical and Experimental Investigation' of a screened loop aerial. The same year, 1938, saw an end, for the time being, of the long series of studies concerned with the nature and location of atmospherics. However, a short time later, the atmospherics Cathode Ray Direction Finder was being used by the Meteorological Office, on a routine observational basis, to add to their knowledge of European weather conditions. The need also arose for world-wide measurements of atmospheric noise levels, particularly at high frequencies; but this work, although contributed to by the Radio Division, was not undertaken at Ditton Park. Ionospheric measurement continued at the site with ever improving equipment. Systematic noon vertical incidence absorption observations were begun in 1938 in addition to the P'-f and critical frequency soundings previously instituted. Many of the staff served with Service departments for various periods of time, among them the officer-in-charge, Dr. Barfield, who was seconded to the War Office to organise and operate a direction finding service. The responsibility for organising and administering the site now rested with Robert Naismith who first came to Slough in 1925, and only recently retired after a career which did much to advance the knowledge of the Ionosphere. In this branch of science, the war years saw the evolution of the Ionospheric Forecasting Service to supply predictions or parameters that would aid long distance communication, particularly for the Services. The observatory, which originated in the early '30s, gradually acquired improved observational techniques which covered a range of vertical incidence sounding from 0.5 to 20.0 Mc/s made at hourly intervals and recorded photographically. The original sounding apparatus was operated manually and had a range of 2.5 to 5 Mc/s in discrete steps of 0.1 Mc/s. The sounder of the mid-'40s was not unlike the present Union Radio model, in which transmitter and receiver are kept in tune by electro-mechanical means, whilst the apparatus sweeps over the 20 Mc/s wide frequency span in about 5 minutes. It was also at this stage that an Ionospheric Substation was installed in N. Scotland to provide extra information for the prediction service. It should not be forgotten that by 1939, although some staff worked both at Slough and Teddington, many important radio investigations were carried out by those whose duties kept them solely at N.P.L. These notes, however, primarily concern Ditton Park so this passing reference must serve to acknowledge a field of activity larger enough to warrant a history of its own. Ditton Park was fortunate in that it sustained no damage during the war. Ever since the Tizard Committee had convinced the Services of the practicability of radiolocation the war had, in a sense, cast its shadow before. Thus, the year 1939 appears as a marker in a tide of events which had affected the station since 1935, rather than the year which to so many marked a complete change in their work and way of life. The end of the second World War meant that the Services needed less help form the laboratories at Ditton Park, so that it was time to consider a revised programme of research more suited to the estimated demands of the future. The Radio Research Board were aware of the need for a broadening of the fields of investigation and felt that such a change required a complete re-shaping of the structure of the organisation. Increasing numbers of outstations were needed, both at home and overseas, for further propagation studies, and general research on ideas developed for scientific wartime needs demanded more laboratory space. Accordingly, in 1946, a report was submitted to the Lords of the Committee of the Privy Council for Scientific and Industrial Research. In this the Board recommended that the Department should have a self-contained Radio Research Establishment under its own director. The annual cost was estimated at £225,000. The report was approved, and work was begun to implement their plan. Detailed ionospheric studies, and the provision of a service of information about ionospheric conditions. Propagation studies of radio waves having frequencies from 10 kc/s/ to 3 x 10 6 Mc/s. The improvement and development of radio measurement techniques, particularly power and impedance measurements above 600 Mc/s. The study of all types of random disturbance giving rise to radio frequency noise. The study of the fundamental aspects of generation and detection of electromagnetic oscillations at the highest available frequencies. The study of the properties and structure, both physical and chemical, of materials used in telecommunications. Provision of means for the 'fullest useful dissemination of information on all aspects of radio'. It was implicit in this report that the direct connection which had long existed between the Radio Research Station and the National Physical Laboratory should cease to exist. In fact RRS staff continued to work at Teddington for several years after this re-organisation of 1948; they were however now members of the newly formed Radio Research Organisation whose first director, appointed in the January of that year, was Dr.R.L. Smith Rose. At this time a number of outstations had already been set up, and more were to follow. The ionospheric observatory at Hillhead, Scotland, had existed for some time; in the Southern hemisphere, at Fort Stanley, Falkland Islands, RRS personnel took over in 1947 an ionosonde station which had formerly been maintained and operated by the Royal Navy. The next year a similar installation commenced operation in Singapore, for measurements in the equatorial region, while in March 1948 the operation of small low-powered apparatus at Port Lockroy in Grahamland provided the first ionospheric observations ever to be made in Antarctica. Nearer home, sites at Sunnymeads and Winkfield were being used for directional measurements. By the end of 1948 a search had begun for a suitable site where a new laboratory could be built. This was to be capable of combining the facilities of the National Physical Laboratory with those of the site of Ditton Park, although it was realised that certain outstations would have to continue. During the late '40s and early '50s research on radio noise, which had so long been part of the station's activities under the heading of 'atmospherics', was extended to include the investigation of an extra-terrestrial noise source. Observations were made of solar noise emitted in parts of the radio frequency spectrum from 30 to 155 Mc/s, and these were correlated with the behaviour of signals received on 18 Mc/s and 191 kc/s. Later a paper by Burgess and Fowler dealing with solar activity and ionospheric effects during 1948 was published in the Wireless Engineer. Terrestrial noise also continued to be investigated on an extended scale, as is evident from the publications of papers by Horner, describing improvements to equipment and dealing with the reception of atmospherics at high frequencies. The fact that V.H.F. fields could exist at distances well beyond the normal line-of-sight limit from a transmitter had been remarked by Marconi in a paper in 1933; but little work had been done on the subject before the second World War. However, as a result of anomalous propagation effects noticed during the operation of powerful military V.H.F. equipment several workers were considering possible mechanisms in the lower atmosphere by which such transmission of energy could take place. Experimental reception of V.H.F. signals was undertaken, first at Teddington, then at Ditton Park and papers by Saxton treated beyond-the-horizon propagation of metre waves both theoretically and, in conjunction with Luscombe and Bazzard, experimentally. The recommendations that the properties of materials be studied resulted in work by Burgess on the experimental and theoretical behaviour of semi-conductor materials, and Saxton and Lane published an account in the Proceedings of the Royal Society of the dielectric properties of certain liquids. It was becoming increasingly evident from the diversity of the work that the proposed new laboratory buildings should be begun as quickly as possible. A search for a suitable site had gone on for some time, disused airfields appearing, at first, particularly suitable. Unfortunately, these superficially attractive areas were found to have disadvantages in the form of nearby noise sources or, less obviously, systems of wiring and other metallic obstructions buried just below the ground's surface. After an extensive investigation a conclusion was reached similar to that when, years before, a site having a more suitable earth conductivity was sought. Ditton Park had its faults; but taking all things into consideration it was as good a site as was likely to be found. It should be remembered that as well as the scientific properties of the area, questions having regard to staff travel and accommodation had also to be considered. Eventually it was decided to build in the West Park of Ditton Park, and work began in May 1954. Meantime the amount of laboratory space had been gradually increased by the erection of wooden buildings in the vicinity of Watson-Watt's earlier construction put up in 1928, and connected to it by a corridor. Further huts were also erected on other parts of the site. This was the station as it was seen by the Duke of Edinburgh when he visited RRS in October 1954. Throughout 1955 various researches continued in these buildings, to the accompaniment of ever increasing interest in the details of the laboratory now in building the improved facilities it would provide. The new laboratory buildings which had been under construction in 1955 were completed by 1st June 1956. During that week the contents of the old buildings were moved to the new accommodation and work started in our present surroundings. In the months that followed some of the wooden buildings which had been built as extensions of the earlier laboratory, were dismantled and re-erected on other sites in the park. Here they provided extra room for those experiments which needed to be spaced well apart from one another and from the main building. A few of the older structures remained, including the original laboratory which, in its day, had been such an improvement on the scattered huts which formed the Station during the first eight years of its existence. It was fitting that the establishment of a new and permanent building for the Radio Research Station should be marked by some ceremony; accordingly on 20th June 1957, a formal inauguration took place. This was performed by Sir Edward Appleton, a most apposite choice, not only because of his long association with the Department and with our laboratory. On this occasion, and on the two days following, the Station was open to several hundred visitors. This inaugural ceremony assumed an extra significance in view of the events which took place shortly afterwards, during the International Geophysical Year which lasted from 1st July 1957 to 31st December 1958. At the beginning of the 'fifties a number of international organisations were considering the possibility of a period of special co-operation dedicated to the study of our environment. The International Polar Year of 1882-83 had been followed, half a century later, by a similar venture in 1932-33, in which, it will be remembered, apparatus and staff from R.R.S. played a significant part. These two events had both taken place near sunspot minimum; now, after a period of twenty-five years, a further investigation was planned. This was to be a greatly enlarged and extended programme of geophysical observation and experiment, not confined to polar regions only, but extending over the whole globe during a period of sunspot maximum. Thus within two weeks of being officially opened, the Station and its outstations were committed to play a most important part in this enterprise. One of the four World Data Centres for the collection and exchange of ionospheric information was established at Slough. The activities of R.R.S. now ranged from Singapore and Nigeria to South America and the Antarctic. On the 4th October an event occurred which made an impact for beyond the confines of the laboratory; the first artificial earth satellite began to orbit the earth, being sometimes in, and sometimes above the main regions of the ionosphere. Here was a completely new tool for investigating the earth's environment, and though to some it appeared as 'a prodigy of fear and a portent,' to the Ditton Park workers it was an opportunity for a quickly contrived experiment in which bearings were taken on the satellite's transmitter. The apparatus used was the cathode ray direction finder, a device whose development through the years owed much to the efforts of RRS staff. These results for 5th October were published in the report of work for 1957. So it came about that the new Station, inaugurated in July was, by October, involved in advanced techniques of space research. It is true to say that ever since about 1894, when Lodge used 'Hertz wave' methods in an attempt to detect long wave emission from the Sun, radio workers have been concerned with events outside our immediate atmosphere. Thus all the ionospheric work, and the Solar noise experiments of 1948 have all, in a sense, made space science no new thing to Ditton Park. What was new was the ability to place apparatus actually within these regions, far away from the earth's surface. Even when the I.G.Y had finished, much effort was needed in analysing and interpreting the many and varied observations which had been made. The earth satellite programme increased rapidly and a most important factor in this progress was the building of a prediction service based on positional observations made at Slough. Interferometer techniques gave improved position findings and negotiations were begun with the National Aeronautics and Space Administration of the U.S.A. for the setting up of one of their Minitrack high precision interferometer and telemetry receiving stations at a site at Winkfield near Windsor. The influence of these events was shown by the remarks in the Radio Research Board's report of work; 'we are convinced of the importance of space research.... the Station must pay increasing attention to the results obtained from measurements aloft and.....should devise its own experiments for flying in rockets and satellites.' The Direction Finding committee was dissolved; 'research work in this field is no longer carried out by the Station.' These two statements seemed to underline the change in emphasis which the new techniques required. Nineteen sixty; forty years had elapsed since the first site at Ditton Park was manned by two workers carrying out certain direction finding experiments. The staff now numbered more than 170 and in recent years the average yearly output of papers published numbered about 35 and covered a variety of work much more diverse than those earlier contributions which Admiral Jackson had so carefully scrutinized. The list of activities is impressive. Space Research. Ionosphere studies. Radio transmission conditions. Tropospheric propagation. Radio noise. Measurements and standards. Semiconductors and ferrites.